I was never a fan of turkey burgers. I always thought they were dry and did not have much flavor. When I heard Oprah Winfrey talk about the turkey burger she had eaten at Donald Trump's Mar-a-lago Resort, I was intrigued by the ingredients. I made my own version of this recipe, hope you like it. Heat enough oil to coat your skillet. Once heated add apples, onion and garlic. Saute until very tender, almost mushy in fact and let cool. Now mix all of the ingredients together. Mix ever so gently with your hands. Over mixing will cause tough burgers. Form into patties and cook in a oil covered skillet. I cook the heck out of mine but I want my turkey done. Check with a meat thermometer, temp should be 160'. Make sure you only turn your burgers once, I cook ours about 7-8 minutes per side. 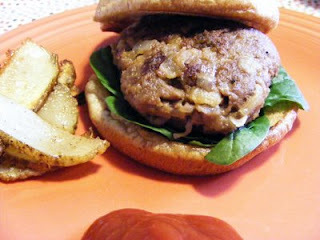 I think these are the juiciest turkey burgers I have ever eaten!